After selection of Donald Trump as US President, several interesting things are getting his name and now ‘Trump Mobile’ has also come in the market. 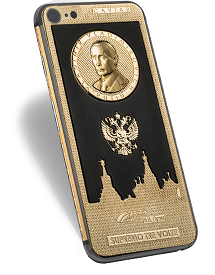 A gold and jewelry manufacturing company in UAE has now introduced a gold-plated Donald Trump Mobile iPhone 7 with a picture of Donald Trump at its back. According to details, 450 diamonds are also attached with this gold-plated mobile that are present around Apple’s log and borders of phone. MD of Goldgenie, Frank Fernando, said about the suitable buyers of this phone that this phone is for extremely rich people in world that have almost everything and it is difficult for them to purchase anything.